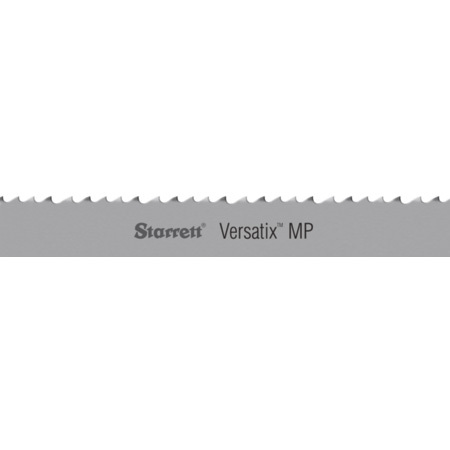 Versatix MP is a bi-metal band saw blade of triple-tempered, high-speed M-42 cobalt steel teeth with alloy steel backing strip. It has a patented tooth design that dissipates stress during cutting for less tooth breakage and longer blade life. Its special set minimizes pinching when cutting structurals and bundles. They are ideal for sawing structurals, tubes and small solids and pull-down, gravity fed machines with uncontrolled feed rates. Positive rake angle tooth design and variable pitch for optimumcutting efficiency in high-production cutting operations. Triple tempered M-42 cobalt high speed steel teeth combinedwith a fatigue resistant alloy steel backing strip. Easy penetration, excellent chip clearance and reduced noise levels. High quality surface finish and faster, straighter cuts.